You can check your current location with your Samsung Galaxy S5 GPS feature. If you need help on how to get this done, you may refer to this guide. This content is primarily aimed at helping new users of Samsung Galaxy S5 who need help in using the GPS feature on their phone, specifically on checking current location. 2. Touch Settings on the next screen. 3. Under Settings, touch Location. 4. Now, drag the Location activation bar to the right. It's located on the upper right corner of the Location screen. Dragging it to the right will enable the function. 5. Touch Mode to continue. 6. You will be prompted with the Locating method. To enable GPS, Wi-FI and Mobile Network support, touch High Accuracy. Doing so will initiate/activate the use of GPS, Wi-Fi and mobile networks on your device to estimate your location. 7. Go back the Home screen. 9. This time, touch Maps. 10. The Google Maps screen will then show up. If this the first time you have used Maps on your device, touch Agree or Accept & continue. 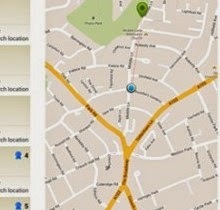 Your phone will then prompt your location on a map, usually with a blue circle indicator. (The result may vary depending on you having a Data connection via Wi-Fi or Mobile network).